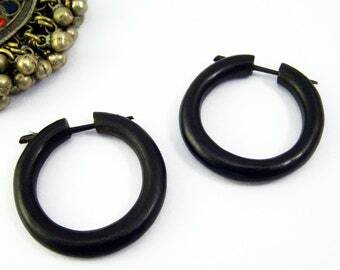 Announcement Welcome to Urban Nomad, Your Fake Gauges Earrings Shop on Etsy! 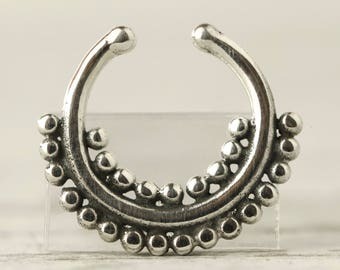 Our love for Piercing and Exquisite bohemian designs for all Body Jewelry inspire our piercings, gauges, plugs, septum. Honoring the individuality of the wearer. 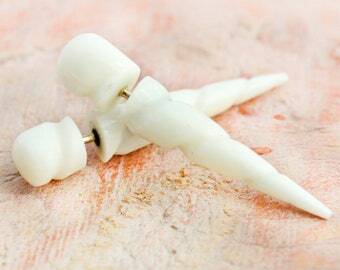 We have taken earrings that were originally made for gauged ears, split them and inserted a sterling silver post. 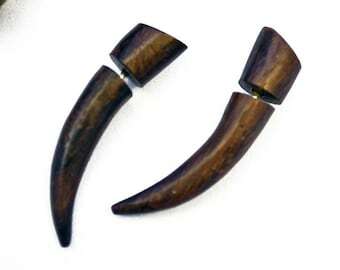 Making them available for people who have always admired this tribal style, but could not make the commitment of stretching their ears. All materials used are eco friendly, all natural, and organic. 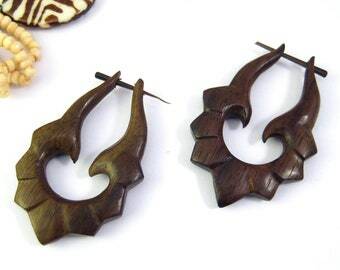 They are mainly from salvaged materials that are turned into a beautiful piece of art you can wear and love everyday. By using mostly salvaged materials, we help to minimize waste. Leave a light footprint on our earth. 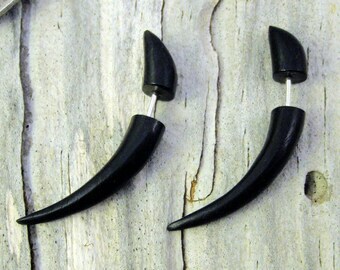 Welcome to Urban Nomad, Your Fake Gauges Earrings Shop on Etsy! Absolutely gorgeous! 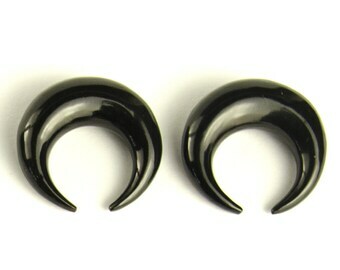 Those earrings hold together really well, they look like real gauges and are very easy to put in. Small enough to be comfortable for running (I ordered these because I wanted nice earrings for when I run agility trials) and large enough to be almost a statement piece. Love those and definitely will buy again from this seller. 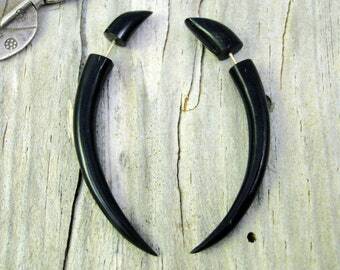 These earrings are fabulous. I get so many compliments when I wear them. 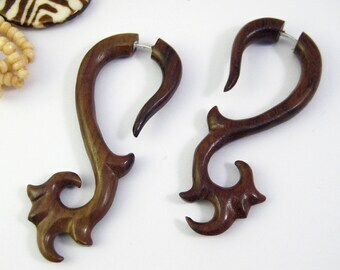 They are beautifully made, super artistic, and a fun way to achieve the look of a gauge when you don't have it. Totally love!!! Urban And Nomad has born out of love for piercing, exquisite designs honoring the individuality of the wearer, an intention for empowerment through self-expression. Urban And Nomad embraces the spirit of the nature within each design. 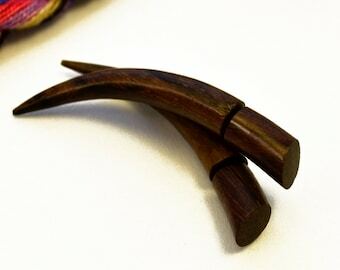 Made from organic materials like different woods and rescued horn and bone, every piece reflects a passion for ethnic and tribal designs. Julian, a young jewelry designer is overseen the entire process, from sourcing materials from many countries, tastefully create each design, and check every step at the handcrafting. All materials used to create our pieces are Eco Friendly, all natural, and organic. 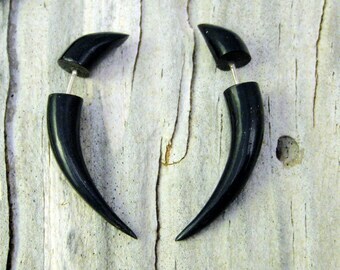 They come mainly from salvaged materials that are turned into a beautiful piece of art you can wear and love everyday. By using mostly salvaged materials, we help to minimize waste. Leave a light footprint on our earth. I'm the designer behind Urban And Nomad. 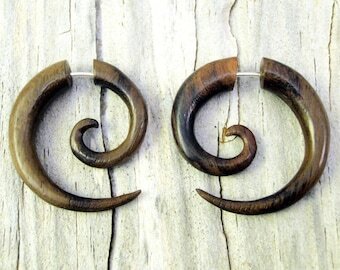 I love natural shapes, textures, and materials. I believe in doing what you love and helping others find their ways. On my free time I love rock climbing and play music. They give our jewelry a high quality plating finish. High quality lost wax foundry, working silver, brass and gold. To complete your purchase, you must provide me with certain information (which you authorized Etsy to provide to me), such as your name, email address, postal address, phone number, payment information, and the details of the item that you are purchasing. Why I Need Your Information & How I Use It? Where We Store & How We Protect Your Data? • We will never pass on, sell or swap your data for marketing purposes to third parties outside the Tofashi Essent SLU wiuthout your agreement. • Access: You have the right to request information about the personal data we hold on you at any time. You can contact Tofashi Essent SLU and we will provide you with your personal data via e-mail. • Portability: Whenever Tofashi Essent SLU processes your personal data, based on your consent or an agreement, you have the right to get a copy of your data transferred to you or to another party. This only includes the personal data you have submitted to us. • Rectification: You have the right to request rectification of your personal data if the information is incorrect, including the right to have incomplete personal data completed. • Erasure: You have the right to erase any personal data processed by Tofashi Essent SLU at any time except for the following situations: 1) you have an ongoing matter with Customer Service 2) you have an open order which has not yet been shipped or partially shipped 3) you have an unsettled debt with Tofashi Essent SLU, regardless of the payment method 4) if you are suspected or have misused our services within the last four years 5) your credit application has been rejected within the last three months 6) if you have made any purchase, we will keep your personal data in connection to your transaction for book-keeping purposes and to comply with our responsibilities with local authorities tax laws. • Object to processing your data: You have the right to object to processing of your personal data that is based on Tofashi Essent SLU 's legitimate interest. Tofashi Essent SLU will not continue to process the personal data unless we can demostrate legitimate grounds for the process which overrides your interest and rights or due to legal claims. • Restriction: You have the right to request that Tofashi Essent SLU restricts the process of your personal data under the following circumstances: 1) if you object to a processing based Tofashi Essent SLU’s legitimate interest, Tofashi Essent SLU shall restrict all processing of such data pending the verification of the legitimate interest. 2) if you have claim that your personal data is incorrect, Tofashi Essent SLU must restrict all processing of such data pending the verification of the accuracy of the personal data. 3) if the processing is unlawful you can oppose the erasure of personal data and instead request the restriction of the use of your personal data instead 4) if Tofashi Essent SLU no longer needs the personal data but it is required by you to defend legal claims. If you consider Tofashi Essent SLU to process your personal data in an incorrect way you can contact us. You also have the right to raise a complaint to a supervisory authority. We take data protection very seriously and therefore we have dedicated customer service personnel to handle your requests in relation to your rights stated above. You can always reach them at rebelmyinfo@gmail.com.